The Memory Craft 9900 utilises intuitive technologies and is smooth, quiet and so easy to use. It offers faster navigation and design layout on a high-resolution LCD colour touch screen, USB port and unique, space saving, swing out embroidery carriage .. in fact, everything you want in one compact, powerful unit. It comes with three inter-changeable coloured covers, red, white and jade. They simply click on and off .. change them to suit your mood or your sewing. If you love precise stitching, this incredible model sews perfect stitches at up to 1,000 stitches per minute in sewing mode and 800 s.p.m. in embroidery mode. 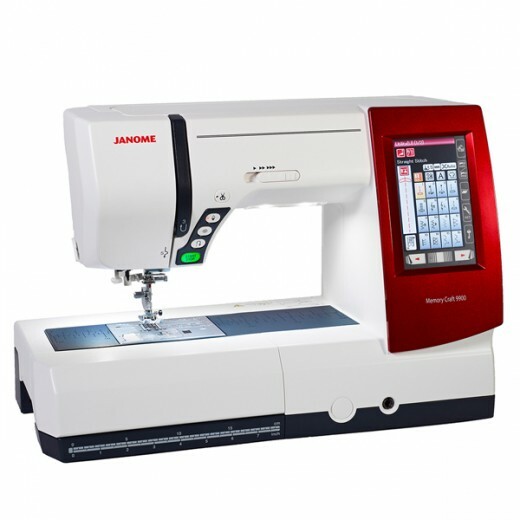 It has all the usual Janome computerised features plus over 200 built-in stitches, including 9mm width stitches, hand look quilting & embroidery stitches and much more. Plus there’s monogramming and 175 exciting NEW built-in embroidery designs. The Memory Craft 9900 also includes Janome’s latest easy set bobbin system, auto bobbin thread cutter and easy change straight stitch needle plate. It even includes a sewing guide to lots of sewing applications such as patchwork, quilting, blind hemming, gathering and many more. Learn as you sew! There’s so much more to know about this superb new model so if you love sewing, embroidery, quilting, making home furnishing or craftwork, just check out the deails below. Don't you wish your machine knew a thing or two about sewing? The MC9900 has a Sewing Applications Menu, where you can choose the kind of technique you'll be using and the machine automatically will give you the optimal settings for your stitch, even recommending which foot to use. (Of course, you're always welcome to make any adjustments you like. The seven-point feed dogs stay parallel as they pull the fabric under the presser foot, giving them more consistent contact. Your fabric is fed through with unparalleled precision and your stitches are simply beautiful. With this system, the straight stitches will go in the exact same holes forward and backwards – talk about accuracy! Pop up the regular plate. Snap in the straight stitch plate. The screen automatically disables all but the straight stitch options. You're ready to stitch on super lightweight fabrics or to handle many quilting stitch functions in seconds. This new kind of bobbin and plate gives you foolproof threading and means you don't have to drag thread tails out the back. The new Bobbin Winder has a plate and cutting blade. The plate keeps your bobbins winding smoothly without the thread accidentally winding under the bobbin. The cutter is handy for cutting the thread without hunting for scissors. These buttons make sewing quicker, easier and more precise. Lock off stitching immediately when using straight or zigzag stitches, set your needle to finish in the up or down position or choose reverse stitching or use the start/stop button instead of the foot control ... they are all so handily placed. Ergonomically designed and adjustable to best fit your sitting position. It allows you to control the presser foot lift with your knee so you can keep both hands on your project. Great for free motion work and appliqué. You can customise and create your perfect Blind Hem by adjusting the bite and the baseline of the blind hem, then save the new settings to the machine's memory so you can use your favourite adjusted hem time and time again. Seam Length Memory. The machine will memorise the length of your last seam stitched so it's ready to do all over again, exactly the same way. This is perfect for repetitive projects, like quilt piecing. Appliqué Begin-At-The-Corner Capability You can set an appliqué stitch to start right on a corner, eliminating the problem of fly out stitching. It's so easy and a beautiful start/finish to any appliqué design. When you're using a twin needle, let the machine know and it will automatically adjust the decorative stitches to the correct width. This minimizes the chance of a broken needle. You can now adjust the downward pressure of the presser foot from 1 to 7, depending on your fabric and technique. This gives you more accurate adjustment and greater pressure at the top end. The MC9900 makes maintaining and cleaning your Upper Thread Guide a breeze. The Upper Thread Guide Cover snaps off to allow you to use the lint brush to clean out any debris from the pretension, then simply replace the cover and you’re ready to sew! Embroidery speed up to 800 s.p.m.